The Canary Islands are the perfect destination for a family holiday. 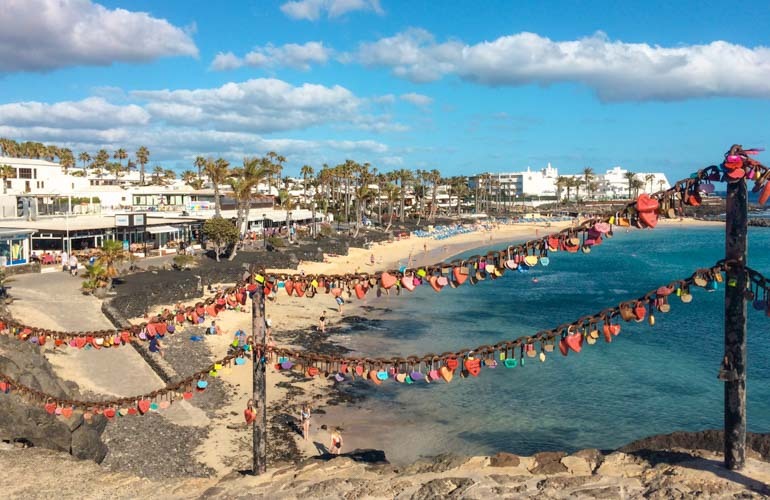 Whether you are travelling with kids or alone there are plenty of things to do in Lanzarote near Playa Blanca and around the compact Island. And Playa Blancahas regular Ferries to Fuerteventura meaning you have another one of the Canaries to explore right on your doorstep. 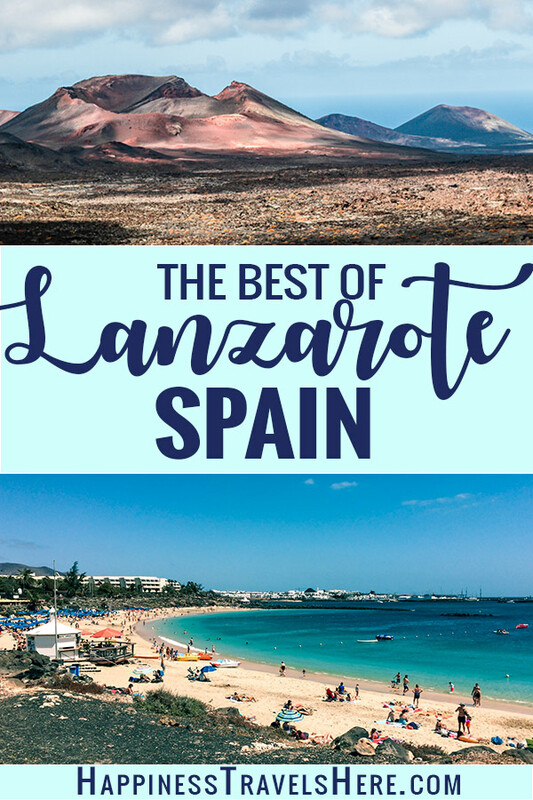 Lanzarote is my top pick of the Canary Islands. Read on to find out why. With it’s white sand beache and crystal clear waters Playa Flamingo is one of the best beaches on Lanzarote. The beach is protected by a breakwater on both sides keeping the waters calm and providing shelter from the wind. Fish can be seen in the clean waters and it is a perfect place to try snorkeling. Sunbeds are available for hire and there is also room to sit on the sand and build sandcastles. A number of restaurants sit above the beach on the promenade and there is a well stocked supermarket here too if you want to have a budget friendly picnic. You can reach Playa Flamingo by biking or walking from Playa Blanca down the sea front promenade. By car you can park on the street and access the walkway from either side of the Tui Flamingo Beach Resort. This is the main beach from which the area gets it’s name. The small beach is very central and just off the main streets of Playa Blanca. It is a pleasant and popular beach and because of this can be busy at times. Playa Dorado beach is east of Playa Blanca and still very central. 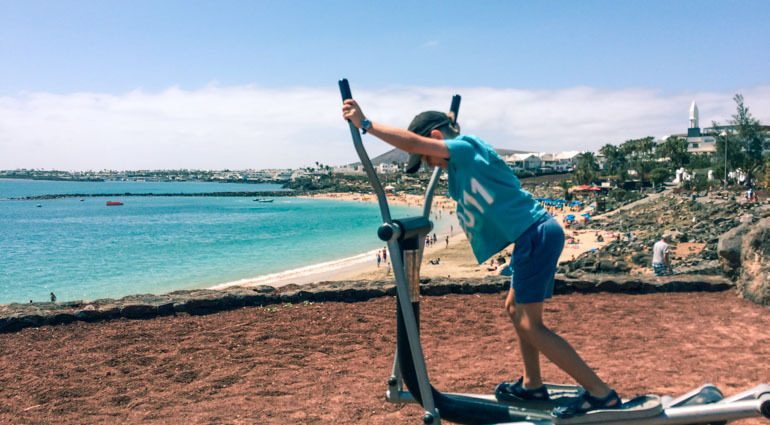 There are more watersports options here as well as fitness equipment perched up the cliff over looking the beach, an incredibly picturesque place to have a workout. There are sunbeds for hire as well as many options for meals and refreshments. 4. Walk the Playa Blanca Promenade. The almost 10 km paved walk-way runs from Faro de Pechiguera light house in the west all the way through Playa Blanca and past Marina Rubicon in the East. The pedestrian only path is easily accessible for walkers and runners as well as for push-chairs, wheel-chairs and bikes. The path runs along the waterfront. Heading westward craggy black volcanic cones can be seen to the right with rocking beaches to the left. Pedestrians heading East will pass sandy beaches and have a view across the ocean to nearby Fuerteventura. There are plenty of places along the promenade to stop for refreshments or a meal. The walk can be extended further by taking the un-paved path all the way to Playa Papagayo. 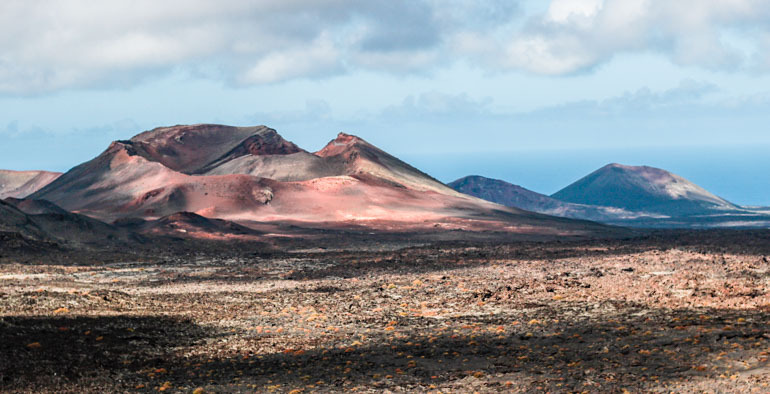 Timanfaya is the largest national park on Lanzarote. The volcanic park was created during a huge eruption in between 1730 and 1736, Lava flows covered the landscape in think black rock. The area is still active today and the Mars-like landscape can be visited on bus. Buses leave from the main visitor centre, the carpark can get full during peak times so it is best to visit before 11am or after 2pm. Around the visitors centre you will also see geysers and food being cooked over the heat of the earth. This cave formed by a Lava tube can be visited as part of a guided tour. The multilingual guide will take you 1km into the cave with an interesting commentary about the history and geography of the area. Papagayo is west of Playa Blanca and can be reached by car or by walking around the coastline. The beaches here are more secluded and less touristy, although also popular with nudists. 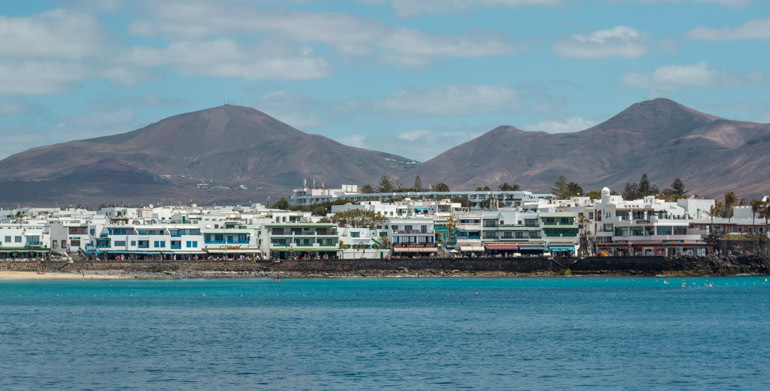 Regular Ferries make the short trip from Playa Blanca to the seaside port town of Corralejo in Fuerteventura. While there is public transport on the Island the quicker and more convenient way to visit some of the sights is to hire a car. Cicar car hire has an office at the ferry terminal. I love that everything is included in the price, full insurance, GPS and kids car seats all come as part of the fee, no hidden costs and super quick pick up and drop off. Just South of the town of Corralejo you’ll find the 11km sand dunes of Parque Natural de las Dunas de. The fine yellow sand stretches on one side of the road down to the azure waters of the ocean. On the other towards the volcanic landscape in the distance. The blue flag beach is patrolled by lifeguards and its calm waters are inviting for swimmers. The is an area for windsurfing and kite-boarding. With kilometers of sand there is plenty of space to lay and enjoy the serenity and beauty of the area, small brick shelters along the beach provide some protection from the persistent wind. Venture across the road and away from the beach to be even more secluded and even spot some of the wildlife, lizards, rabbits, goat and camels can be seen here. 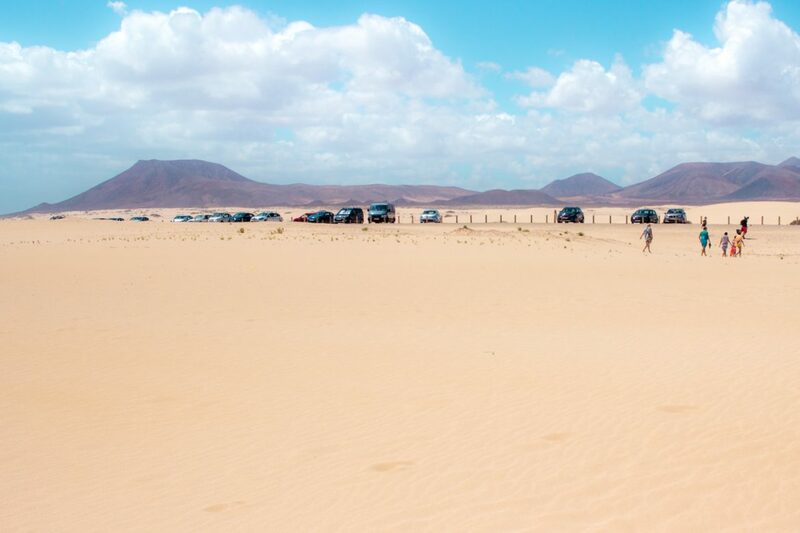 Local companies run horse-riding, camel-riding and quad biking around the dunes and along the beach. A regular bus runs to the dunes. As the dunes are so large it is best to take your own water and snacks if you plan to spend some time there. One of the main reasons we visited Lanzarote was for some winter sun. Lanzarote turned out to be so much more than just a sunshine holiday and we fell in love with this Island. Before we visited the Canary Islands all I had heard was that they were touristy, tacky and windy. Well it was windy at times but Lanzarote was far from touristy and the Island has done an excellent job of preserving its heritage and protecting itself from over development (Fuerteventura didn’t do so well in this regard). Full of Spanish culture, beautiful beaches, dramatic volcanic landscapes and endless ocean it was the perfect holiday destination especially for an active family like ours.